The Edwards 868 series is a low current, high decibel, weatherproof surface mount, electronic horn for outdoor or indoor use. It has been designed for mounting with the supplied weatherproof back box. 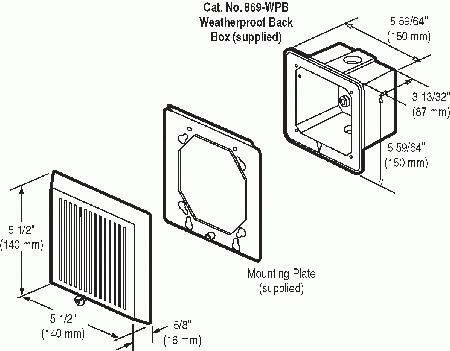 The 868 mounts, using the supplied gasket, to the gray, corrosion resistant weatherproof surface box supplied with the unit. The box measures 5 59/64" (150mm) square by 3 13/32" (87mm) deep. The 868 electronic horn is for indoor and outdoor use wherever a distinctive, audible signal is required for timing, scheduling, general alarm, and emergency warning applications.